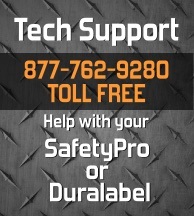 Lifetime SafetyPro Tech Support, online or by phone, we help Duralabel owners too! Check Out our youtube channel for more support videos. The Windows Driver and Getting Started Guides are available for download online. Additional safety labeling software or replacement software is available for download to current customers upon request. For FacilityWare, RTK Label Creator, or Arc Flash Labeler, please contact us directly at 877-762-9280. Our Frequently Asked Questions area answers most new-user and tech support related questions. If you still need help, remember that your SafetyPro comes with lifetime free technical support! We are committed to ensuring your satisfaction for as long as you use the printer. You may call us toll-free any time for support at 877-762-9280. Getting started with the SafetyPro is easy, but if you're running into any snags, we are here to help. Below you will find some common errors that are made when users are first starting with an industrial labeling system of any kind. If you're running into startup troubles, please read through the following, or contact us at 877-762-9280 any time for a walk-through or additional help. The Form Feed button on the top of the printer is used only to feed out blank material, and is setup to process the form feed based on the last successful print after powerup. If you use the Form Feed button immediately after loading or powering on the machine, there is a good chance the printer will be in a default mode, and the Form Feed button will no work properly. If when pressing the Form Feed button you get a red blinking light, or if your ribbon is pulled out with your label stock, simply reload and reset your printer, without pressing Form Feed, and print 1 label. Now your Form Feed button should work properly. It is highly recommended that you do not use your Form Feed button unless you really simply want to feed out blank material. If you need to use Form Feed, only do so after printing a label successfully. The Form Feed button is not a valid way to clear an error and is not a part of proper supply loading. For continuous roll: If you are using 150' continuous vinyl rolls for printing, you need to set your sensor to "continuous." For older drivers, use the "Advanced Setup" > "Sensor Type" and set to "Continuous". for the latest driver, use the "Stock" tab, "Media Setting" > "Type" > "Continuous". For die-cut labels: If you are using die-cut arc flash, RTK or ANSI rolls for printing, you need to set your sensor to Vertical Gap. For older drivers, use the "Advanced Setup" > "Sensor Type" and set to "Vertical". for the latest driver, use the "Stock" tab, "Media Setting" > "Type" > "Labels with Gaps". You should never use a "Peel" option for the post print action. If you have printed using the wrong sensor setting you may need to reset your printer memory to factory defaults with a simple process. Contact 877-762-9280 for quick and easy help with this problem.